The 2018 hunting season pictures are starting to roll in. Why are we better than other outfitting operations? 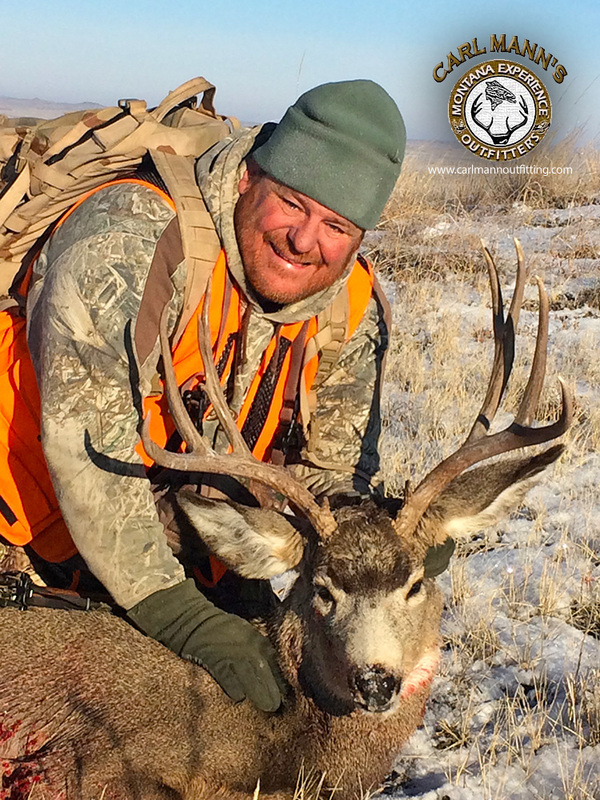 You will have multiple opportunities to locate and shoot good mule deer bucks. We offer an extremely good product! 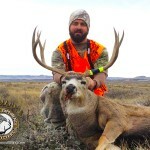 You will have multiple opportunities to locate and shoot good mule deer bucks. 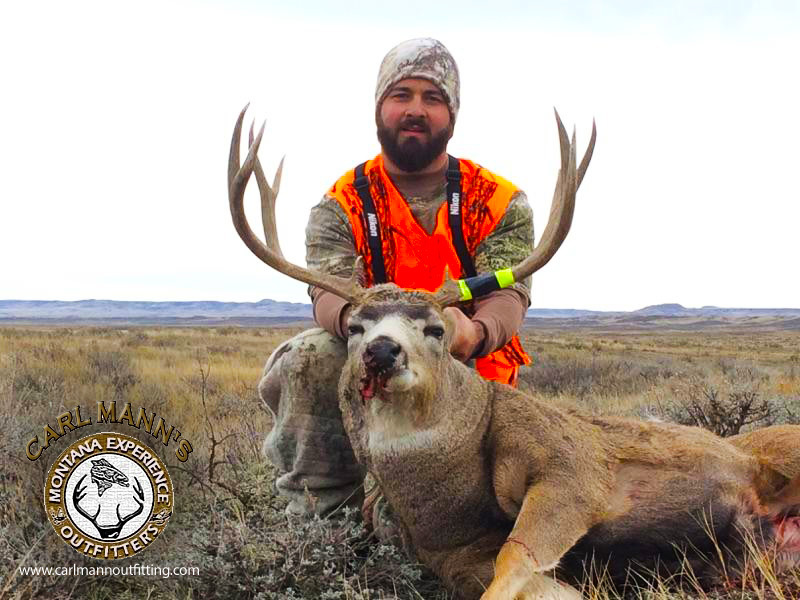 You are able to hunt other species such as upland game, waterfowl, fishing, and coyote hunting at no extra cost. 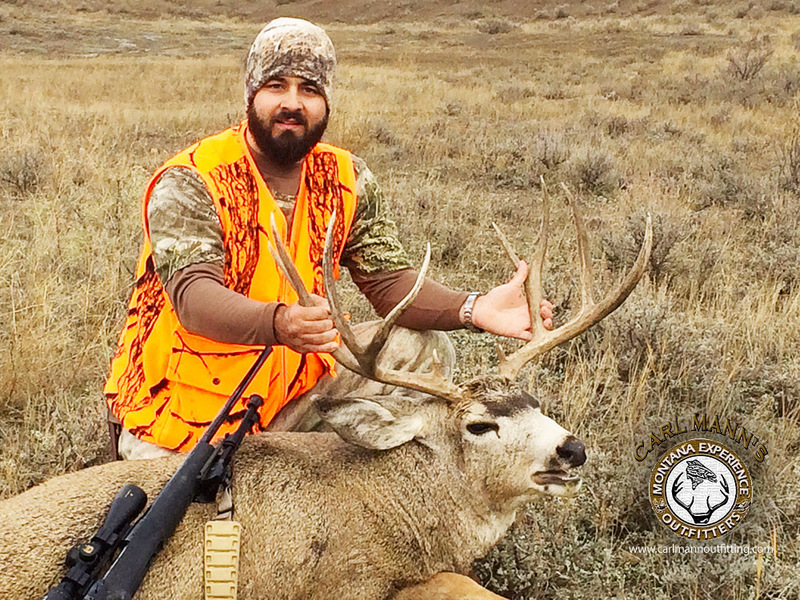 Our hunting locations are in a sparsely populated area in Montana located in the Northeast corner of the state. 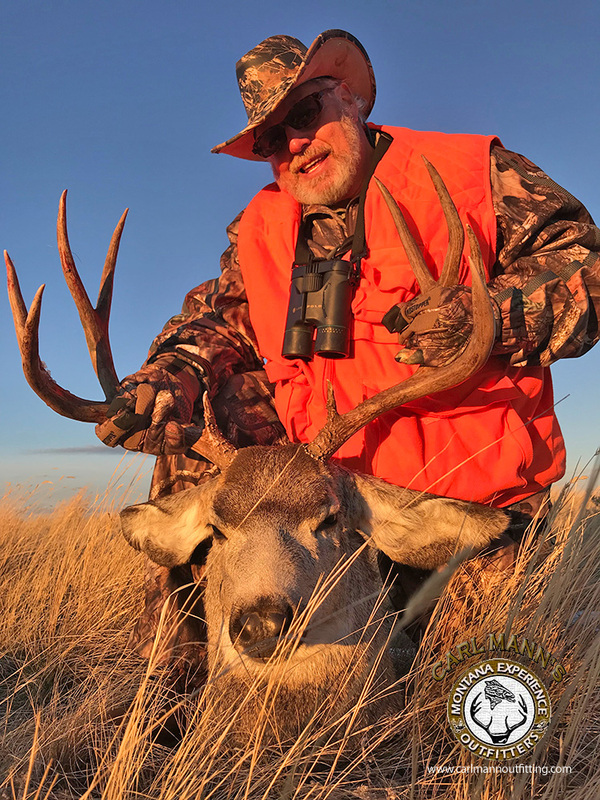 The hunt takes place near Fort Peck Reservoir, which is bordered by the Charles M. Russell Refuge, surrounded by BLM land. This area is know as the Missouri River Breaks. The hunting area encompasses approximately 8.5 million acres. Our hunting guides are top notch professionals. They guide hunters because they really have a love for their profession. My guides have tremendous eyes for spotting the game. 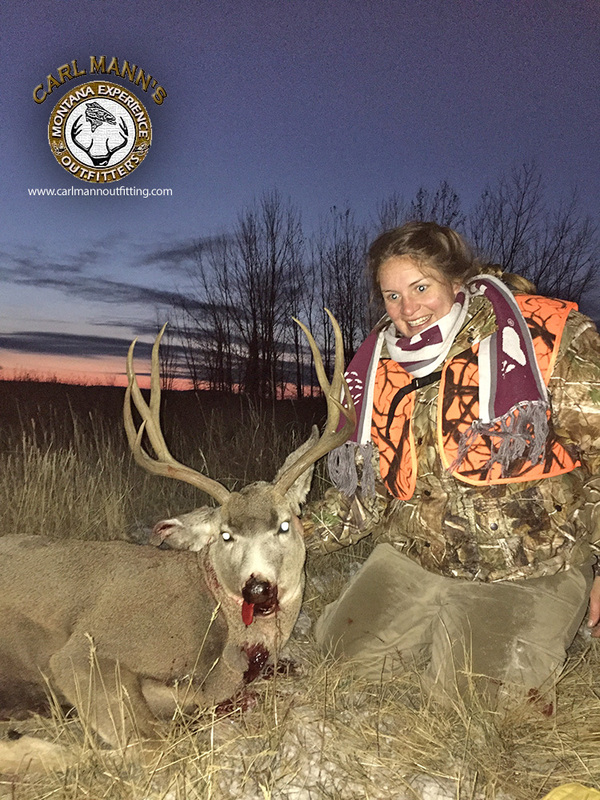 Our clients are always amazed at how well the guides plan the stalk and put them right up on the deer. The guides will do most of the work, cleaning and packing your deer out. That is why we will shoot at a deer where ever we find it regardless of how far it is from a vehicle. However, we do suggest you help your guides with part of the pack out if possible to appreciate the full experience of the hunt. This hunt comes at a time of year when the weather is generally nice. 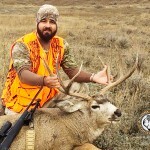 This is an excellent opportunity to score a big antelope buck. 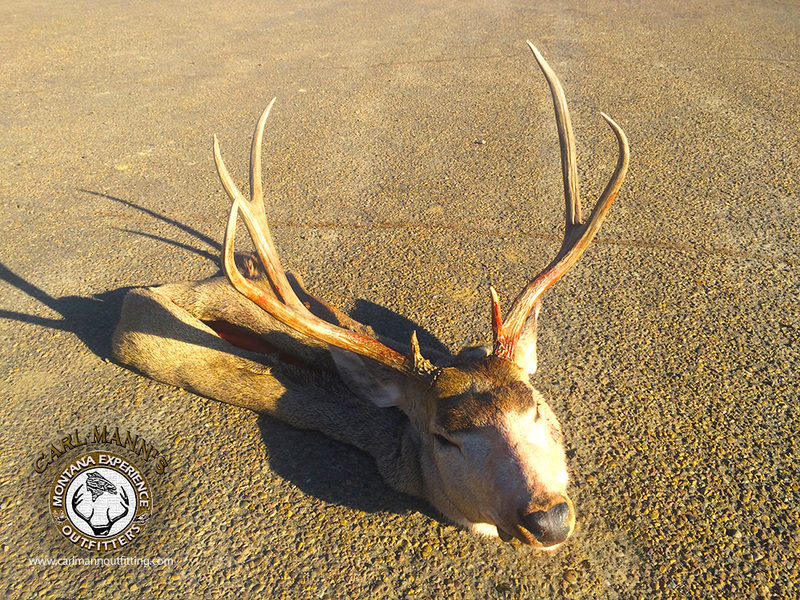 The mule deer bucks at this time of year will vary in size. 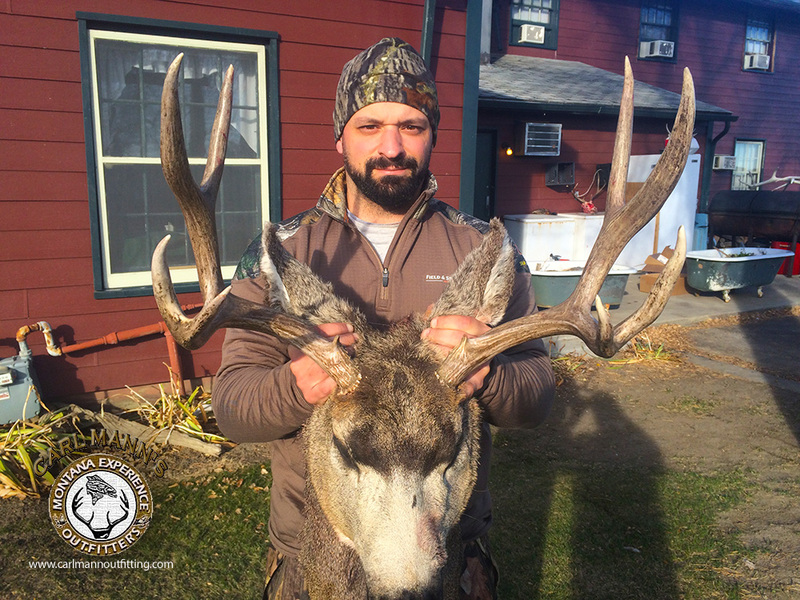 This hunt takes place in the early part of the rifle-hunting season and I find that the bucks tend to run in bachelor groups. Those hunters who are willing to work and hold out usually take 4x4’s. After you have filled your big game tags, there is bird hunting available. There are ample quantities of pheasants, sharptail grouse, hungarian partridge, sagehens and assorted waterfowl. To test your shooting skills, I also have coyote and prairie dog hunting available with this hunt. We always find the game we are seeing. We see an average of 60 to 100 mule deer a day. From that number you may see 10 to 25 bucks. Out of that one or two of those will be what we call "wall hanger bucks". if you miss your opportunity that day this is where we are different than other outfitter/guide agencies: you will get to repeat the first day and the same numbers over and over again. Our percentages are 98-99%. The only time we do not fill a buck tag is because the hunter has missed multiple times over the multiple days, or runs out of ammunition. I know this is a bold statement, but we have been in business for over 36 years and we have proven this over and over, year after year. 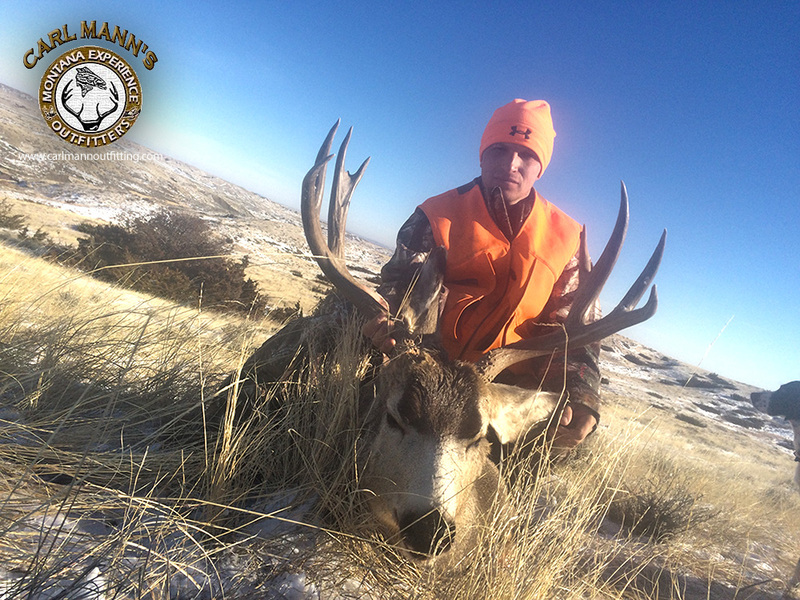 This hunt coincides with the mating season at the peak of the rut for the bucks of the Missouri River breaks. 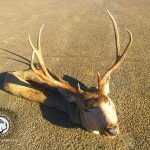 This hunt is for the discriminate mule deer hunter who would like to hang a trophy buck on the wall. At this time of year the big bucks seem to come out of their hiding places and make themselves available as they move all day long across the prairie in search of does in heat. The bucks are more plentiful and are very visual. Your chances of taking a wall hanging 4x4 or 5x5 are 90-100%. 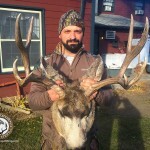 I can put you within 225 yards, standing broadside to one of these magnificent bucks. As is with all of my hunts, lodging, great food, experienced friendly guides, and trophy handling will be taken care of for you. All you need to bring are a few personal items and a desire to enjoy hunting at its best. I am sure that I have answered some of your questions about what I offer. I am also aware that there is a lot more questions that must be going through your head. I would welcome the opportunity to answer these questions for you, and to talk to you personally. Please call me toll free at (800) 435-4651. References: Available upon Request. I urge you to call them. My past customers are my best sales people.